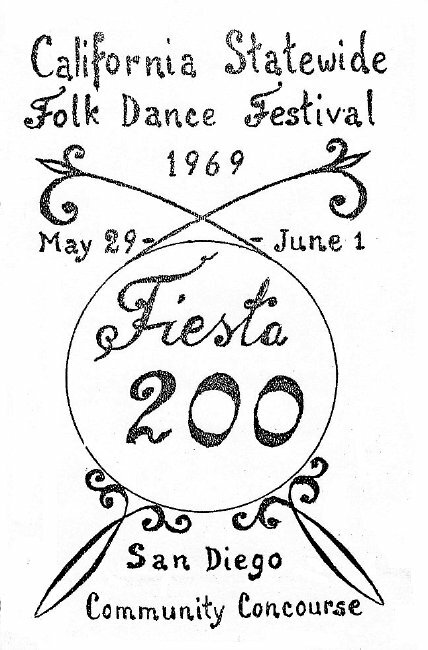 We have always liked San Diego and had the opportunity to rekindle that fondness by visiting their fair city for the 24th Annual Statewide Festival, May 29th through June 1st, 1969, for "Fiesta 200." Headquarters hotel this year is the stately old U.S. Grant. President of the South, Alice Hauserman, in her program welcome to the North President, Bruce Mitchell and folk dancers everywhere, explains that "Fiesta 200" celebrates San Diego's 200th anniversary of Father Junipero Serra's establishment of a mission in San Diego, July 16, 1769. We assure the good Father we will do justice to "Fiesta 200" and thank him for furnishing us with such a good reason. 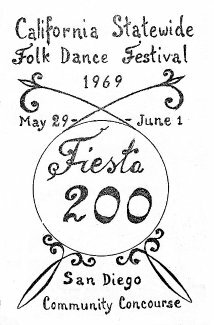 A four-day Festival suits folk dancers just fine and "Fiesta 200" started right out with the Opening Party, Thursday, May 29th, at Convention Hall, 8:00 p.m. to 11:30 p.m. There would be dancing at the same location Friday afternoon, Friday night, Saturday afternoon, and Saturday night, as well as Sunday afternoon. The above schedule would be interspersed with an Institute on Friday night, the Concert on Saturday night, and a Costume Photo Session Sunday afternoon. A pleasant surprise was an invitation from the Gandy Dancers to a party at 5:00 p.m. on Friday, May 30th, in Avis Tarvin's room at the U.S. Grant. The Installation Brunch on Sunday morning was also in the U.S. Grant. As has been the custom recently, we all received a program, listing Statewide Festivals, incoming and outgoing officers, and Past Presidents, a list that is beginning to fill up a page. It's becoming quite a distinction to show up wearing your Past President's pin and being asked, "When were you president?" Our dancing may be getting a little rusty but we keep the pin shiny bright. We will now take a moment to list a few of the many on the Committee who worked to make the Festival such a big success. First, there is General Chairperson, Alice Hauserman; of course, special praise is due Elizabeth Ullrich and John Hancock for the fine Concert; Decorations were handled by Paul and Dorothy Tornheim; Installation Brunch and Program by Janet Phillips and Avis Tarvin; Institute by Nancy Denov and Mikki Revenaugh; Masters of Ceremonies by Valerie Staigh; and Square Callers by Ann Farrell. There were many many more deserving and they, along with the Concert performers, certainly contributed their share. It takes a lot of people to put on a good Statewide and San Diego certainly has the right people to do it.